There are a lot of things that look complicated but one does not dare to ask others about, since one is supposed to know! You know the feeling: electric fencing is one of them. Why would you use electric fencing? Traditionally, animals that you have on the paddock like to rub on fences which can do an awful lot of damage to the fences as well as to animals, especially if the present fence has barbed wire on top. If you electrify your fences you keep your animals away from posts and wires and prolong the lifetime of them. At the same time you put up a barrier which animals soon learn to respect. In other words electric fencing not only keeps your animals within the boundaries they are supposed to be, but it also protects your fences from damage. Electric fencing is also the answer for areas where temporary fences are required i.e. shelterbelts, strip grazing, dam protection etc. How does it work? The principle is quite simple. Just imagine a broken circle. When you close it, you get “snapped”. In other words you attach the positive terminal of your energizer (+) with an insulated lead to the fence you want hot. Then attach the negative terminal (-) which is on the other side of the broken circle to the earth. The earth may consist of one, two, three or more galvanised pipes or rods that are approx. 6 ft long, at least 3 metres apart and have been hammered into the ground in a straight line in a permanently damp area, the wetter the better. Caution: If you’re not familiar working with electric fences, consult your electrician. This information is intended to provide general tips – please contact your electrician if the problem persists or you need further advice. Over 90% of all failures can be traced back to poor grounding. If an animal stands on the ground and touches the hot wire it closes the circuit and gets “snapped”. However, a bird that is sitting on the hot wire does not feel anything because it does not close the circle. All wires you want “hot” must be properly insulated. In other words the hot wire must not be in contact with the ground through battens, posts, waratahs or for that matter any uprights. This would close the circle and “short the fence out”. When it rains wood posts or battens get soggy and become conductive. Waratahs are conductive all the time. Therefore, plastic insulators are used to keep the hot wire away from any possible contact with the ground. You can add hot wires when you put up a new fence. In both cases you save a considerable amount of money. A permanent fence may no longer be strong enough to keep the animals within the boundaries. However, an electric wire or two will keep them away – especially if you use outrigger insulators – and take off the pressure on the old fence. It will last for another few years or even longer. If you put up a new fence you can use posts every 6 – 8 meters; no battens are required. Strain the wires about half as tight as you would normally. Three to four hot wires are recommended for cattle, five to six for sheep. In case they get cunning and jump through the fence – which would not close the circle and, therefore, would not “snap” them – you have to resort to a system that has alternate “live” and earth wires. In other words the top, middle and bottom wires are hot, the second and fourth are neutral. If an animal touches both wires it closes the circle as well. This system is a bit hard on dogs because they have to jump over the fence and can no longer go through them. It is also an excellent system in case earthing your unit is difficult due to too dry soil. Remember: If you are buying a new computer or modem, talk to your retailer about a modem that will work satisfactorily from your premises. Mains powered units which are plugged into a 240 V socket. They are certainly more economical than the next class of energizers. With a battery charger which means you require two batteries (one to be charged and the other one “working”). With a solar panel that continuously charges the battery during daylight. Find out where there are telecommunication cables or phone lines on or near your electric fence. This includes both buried and overhead wires and cables. They almost always run along or near the roadside reserve or along driveways. A marker post or grey connection pillar should be nearby. If you can’t work out where they are call Telecom, on 124, for help. Identify the electric fence wires and connecting leads within 100 meters of the phone lines and running either parallel or nearly parallel to them. Long sections running parallel to the phone lines feeding other sections are more likely to be a problem than short sections that go nowhere else. Check the current in these wires. You can use a Red Snap’r Fence Doctor, Pakton Power Probe or any other fault finder to do this. The current in a well-maintained fence should be less than two amps per kilometer of energised fence line. If it’s higher, there could be a short on the fence, too much overgrowth, live wires contacting the ground or old deteriorating insulators.Work along the section with high current, and the downstream parts fed via this section, to locate and fix shorts by removing overgrowth, fixing live wires touching the ground and replacing old insulators. If, after fixing faults, the current is still to high, find a way to feed the main supply through sections of the fence that are further away from the phone line. For example feed the power out through fences in the middle of the farm, away from the phone line, rather than through the roadside boundary fence next to the phone lines. The ideal way to set up your electric fence is to feed the power out from the energizer in a “star” fashion, with no closed loops and low currents in parts of the fence that closely parallel phone lines. © 2004 Hans Dresel, of Artex International; the home of Red Snap’r electric fence systems. Artex achieved the accreditation of ISO 9002 in 1995 and in 2001 qualified for ISO 9001. artexnz@xtra.co.nz. 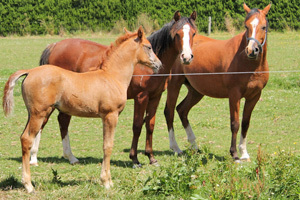 Haha, please publsh an article on electric fencing for HORSE dummies!! I bought my electric fence supplies from one supplier except for ground rods and T Posts. I installed per instructions. I have arcing from the fence wires to the T Posts. This is mostly random arcing, one then another. The fence charger is Stafix X3 and I measure 9.9 KV, but that is the maximum my meter will measure; therefore, it could be higher than 10 KV. The supplier says it is no problem having arcing. Tru-Test, the manufacturer of the fence charger says arcing is not a good idea and I should replace the insulators. What do you say? Im going to put one hot wire on about 400 feet of corral panels to keep my Mule from eating my neighbors Horses tails. I have found some pretty good looking plastic insulators that would only keep the wire about 1/2″ away from the panels. Do you think that is to close? In the past I have modified 5″ Tee post insulators and they work great but don’t last to long. Im just worried that even if wire is not touching metal that it could jump and make contact when wet. This is a great article. We have found that people often overlook a few basic steps to ensure that they set up their electric fences safely. Wish more people would have a hunt around for these types of articles before giving it a go for the first time! I have a 60 km electric fence system. In many places there is the opportunity to make the circuit circular – that is, to connect the beginning of an elect fence wire to the end of the same line. The question is – is it better (in the sense that the system works better) to complete this loop or is it better to not join the end to the beginning? Also, where you have two or more hot wires on the same fence line, should these be looped back to each other or do they work better if they are individually hot? This is a great article. We have found that people often overlook a few basic steps to ensure that they set up their electric fences safely. Good thing you have shared this information with us! Is it necessary to use wooden posts? I am looking to split a pasture and would like to have the option for portable fencing. I have a cable reel which has become tangled. Does anyone have any suggestions on how to disentangle and rewind onto the spool!